NASHVILLE, Nov. 1, 2018 /Christian Newswire/ -- On October 30th, over 700 theaters nationwide debuted Director Rick Altizer's new documentary, "I Still Believe." The film chronicles the life of one of Gospel and Contemporary Christian Music's all-time vocal legends, Russ Taff, by outlining his childhood, rise to stardom, subsequent hidden struggle with alcohol, and ultimately his path to recovery. "I Still Believe" is not only a story of redemption, but one that also shares the intimate tale of the unending support of his wife, Tori, his family, friends, and the Christian community as a whole. Fathom Events, a partnership between the nation's three largest film exhibitors, (AMC, Cinemark, and Regal Entertainment), stated that Tuesday night's event was the most attended and highest grossing faith-based musical event in their history. Post Hill Press, an independent publishing company based in New York and Nashville, is publishing a companion hardcover book, which will provide a deeper look into the Taff's inspiring story. "I Still Believe: A Memoir of Wreckage, Recovery, and Relentless Love" publishes February 26th, 2019, and will coincide with the DVD and Blu-Ray release of the film. Ziccardi said, "Post Hill Press was privileged to have a hand in this powerful documentary, and we are even more excited to publish the companion book, written by Russ, Tori, and longtime friend Mark Smeby. It's our hope that both the film and the companion book which will tell even more of the Taff's story of love and redemption, will touch the hearts and lives of those who may have or are currently struggling with alcohol or substance abuse. The book and film are more than music memoirs. They're a vivid picture of a wife's love for her husband, his love for his family, and the strong faith that has made them whole." 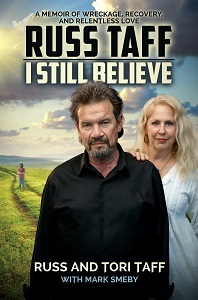 "I Still Believe: A Memoir of Wreckage, Recovery, and Relentless Love" by Russ and Tori Taff with Mark Smeby releases February 26, 2019. ISBN: 978-1642931488. Distributed by Simon and Schuster. Media inquiries, interview and promotional requests, and digital review copies of the forthcoming book, "I Still Believe: A Memoir of Wreckage, Recovery, and Relentless Love" may be directed to Post Hill Press Publicist Devon Brown: devon@posthillpress.com - 615-261-4646 x104.